Order the desired number and dimension of hedge panels or vertical gardens to fit your wall, fence, or structure. Connect the panels (if needed, they can be easily cut down to size using a pair of scissors and then joined with cable ties). Staple, tie, screw or adhere panels to fence or wall, making sure to securely attach them. In minutes, you’ll transform your property by creating a green wall that requires absolutely no maintenance and looks great 365 days of the year. Customize the shape of your hedge on the mounting area. Connect the panels together by snapping the backs together. Use a zip-tie to anchor it onto the surface or staple the panels to the wooden fence to securely attach them. Step back, relax and enjoy the view! It's that easy! Note: We would recommend that for each boxwood hedge panel (20 in. x 20 in.) you staple 4 staples across the top and then 3 rows of 4 more staples to ensure secure attachment. Attach timber beams vertically to the metal fence spaced at intervals of around 15 in. You can then add a horizontal beam across the top and bottom by attaching it to the vertical posts. Attach the hedge panel to the timber beams, or directly into the fence using a screw and washer. We would suggest attaching the panels using around 12 screws + washers per meter panel of green wall. Continue to join each panel using the clips and repeat step two ensuring to securely fasten your artificial hedge directly to the wood beam. 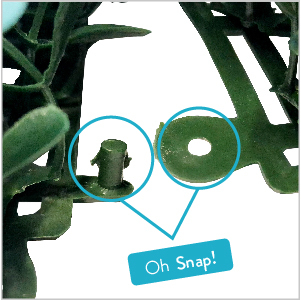 Note: You may also choose to attach your leaf hedge directly into the metal using a metal screw and washer combination, however, please note that this may not be suitable as the screws are likely to poke though into your neighbor's property! The timber can be attached at the top and bottom (using the capping) of the fence to avoid screws going through the metal and being exposed on the other side.